Improving our understanding of ecosystem-climate feedbacks is necessary for creating more realistic scenarios of future change and for designing effective climate mitigation policy. Kooperman, G.J., Y. Chen, F.M. Hoffman, C.D. Koven, K. Lindsay, M.S. Pritchard, A.L.S. Swann, and J.T. Randerson. 2018. 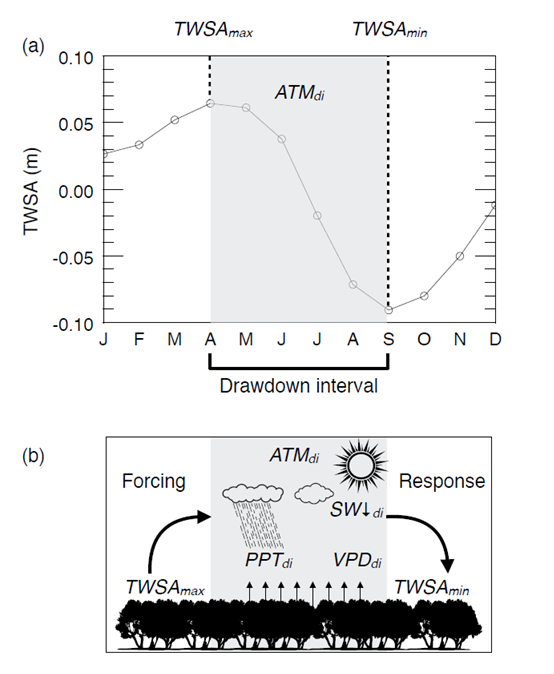 Forest response to rising CO2 drives zonally asymmetric rainfall change over tropical land. Nature Climate Change. doi: 10.1038/s41558-018-0144-7. Levine, P.A., J.T. Randerson, S.C. Swenson, and D.M. Lawrence. 2016. Evaluating the strength of the land-atmosphere moisture feedback in earth system models using satellite observations. Hydrology and Earth System Sciences. 20: 4837-4856. doi:10.5194/hess-2016-206. Swann, A.L.S., F.M. Hoffmann, C.D. Koven, and J.T. Randerson. 2016. Plant responses to increasing CO2 reduce estimates of climate impacts on drought severity. Proceedings of the National Academy of Sciences of the United States. doi:10.1073/pnas.1604581113. Rogers, B.M., A.J. Soja, M.L. Goulden, and J.T. Randerson. 2015. Influence of tree species on continental differences in boreal fires and climate feedbacks. Nature Geosciences. doi: 10.1038/NGEO23. Tosca, M.G., J.T. Randerson, and C.S. Zender. 2013. Global impact of smoke aerosols from landscape fires on climate and the Hadley circulation. Atmospheric Chemistry and Physics. 13: 5227–5241. doi:10.5194/acp-13-5227-2013. Rogers, B.M., J.T. Randerson, and G.B. Bonan. 2013. High latitude cooling associated with landscape changes from North American boreal forest fires. Biogeosciences. 10: 699–718. doi:10.5194/bg-10-699-2013. Tosca, M.G., J.T. Randerson, C.S. Zender, M.G. Flanner, and P.J. Rasch. 2010. Do biomass burning aerosols intensify drought in equatorial Asia during El Nino? Atmospheric Chemistry and Physics. 10: 3515–3528. Randerson, J.T., H. Liu, M.G. Flanner, S.D. Chambers, Y. Jin, P.G. Hess, G. Pfister, M.C. Mack, K.K. Treseder, L.R. Welp, F.S. Chapin, J.W. Harden, M.L. Goulden, E. Lyons, J.C. Neff, E.A.G. Schuur, C.S. Zender. The impact of boreal forest fire on climate warming. 2006. Science. 314: 1130-1132.